USD senior receivers Reggie Bell (#3) and Brandon White (#13) sporting what appears to be a new helmet design for the 2014 season. Two weeks before they host the season opener against Western New Mexico, the Toreros held it's annual scrimmage for alumni and donors. With the passing game accounting for a combined seven touchdowns, the race for the starting quarterback job became a little more intense. The coaching staff is hoping to make the big decision sooner rather than later. 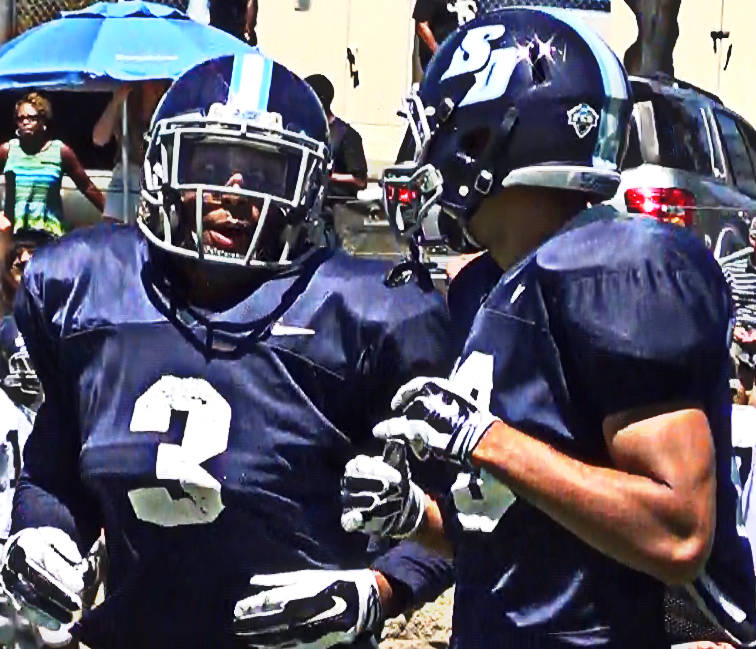 "I think it will be sometime this week," USD head coach Dale Lindsey told us after the scrimmage. "We got to decide by the middle of the week." Sophomore Keith Williams and redshirt junior Trey Wheeler shared first team reps and looked equally impressive in their outings with the help of senior receivers Reggie Bell (2 TDs), Brandon White (1 TD), and D'Angelo Barksdale (2 TDs). 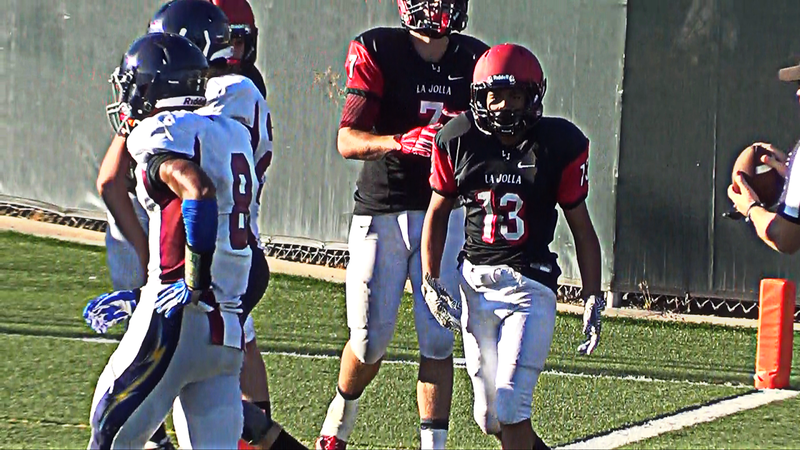 Freshman receiver and Westview High product Cody Williams put himself in the mix with two touchdown catches of his own. SDFNL Magazine hosted it's first-ever Gridiron Kickoff Classic at Francis Parker High School. The event featured eight prep football programs from all over San Diego County playing in four scrimmages. The stands were packed during every game, and over 1,000 canned goods were donated to the San Diego Food Bank. Palo Verde Valley 40, Calvary Christian Academy 6. La Jolla 45, Scripps Ranch 31. #10 El Capitan 28, Hilltop 0.